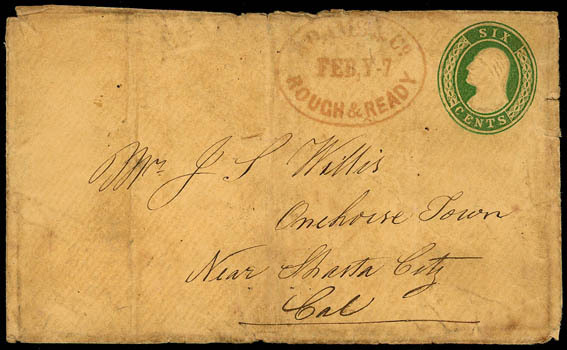 (Rough & Ready) Adams & Co., Rough & Ready, Feb,y - 7 (Nevada), red oval on 6¢ Nesbitt entire to Onehorse Town near New Shasta City Cal. ; cover faulty and soiled, Fine. THE ONLY RECORDED EXAMPLE OF THE ADAMS & CO ROUGH AND READY OVAL HANDSTAMP. (Rough & Ready) Pacific Express Co., Rough & Ready, clear strike of red double-oval and matching bold "PAID" framed handstamp on 3¢ red #U10 front to General H.P. 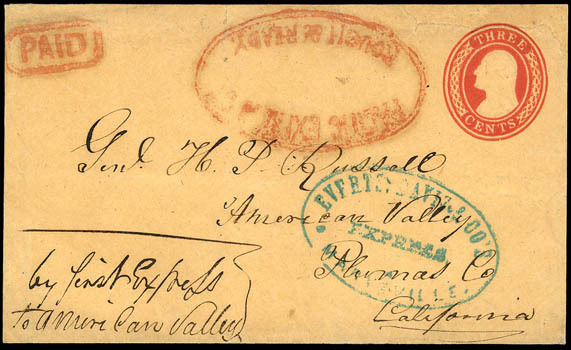 Russell, American Valley Cal., endorsed "by first Express to American Valley" at lower left, blue "Everts, Davis & Co's Express, Marysville" oval handstamp; top edge restored and rebacked. 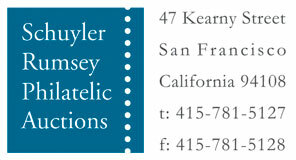 THE ONLY RECORDED EXAMPLE OF THE PACIFIC EXPRESS CO. ROUGH & READY OVAL HANDSTAMP. 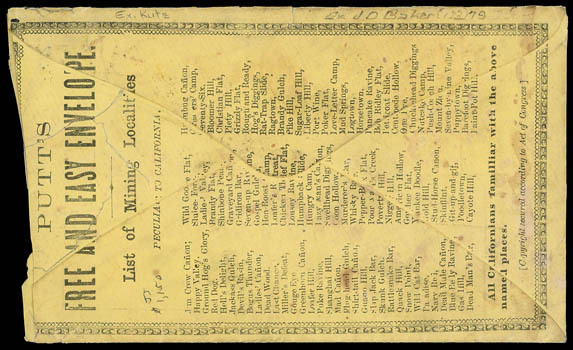 (Rough & Ready) Putt's Free And Easy Envelope, all-over illustrated design showing train on cover with satirical inscriptions, "The Humbug Railroad" at left, all-over reverse listing of 100 unusual California Gold Mining localities, entered mails with "Sacramento Cal. Apr 17" cds and bearing 3¢ rose (65) tied by quartered cork cancel; reduced irregularly at right well into adhesive, Fine, ex-Baker, Beals. THIS IS THE ONLY RECORDED EXAMPLE OF THIS PUTT'S FREE AND EASY ENVELOPE. 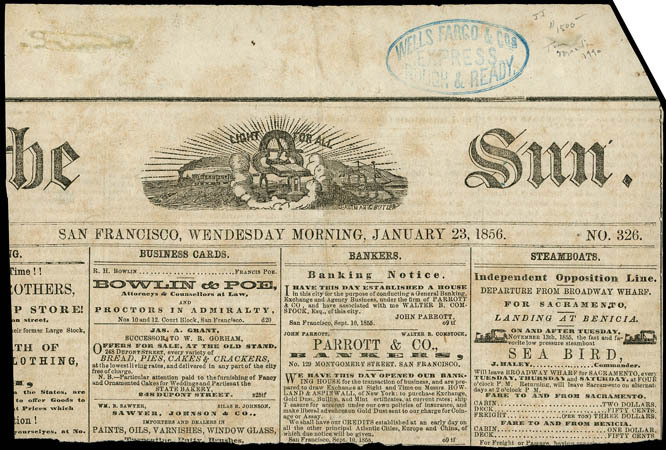 (Rough & Ready) Wells Fargo & Cos Express, Rough & Ready., blue double-oval handstamp on part of front page of San Francisco Jan. 23rd 1856 "The Sun" newspaper, includes "Steamboats" section showing the Independent Opposition Line departure of the "Sea Bird". 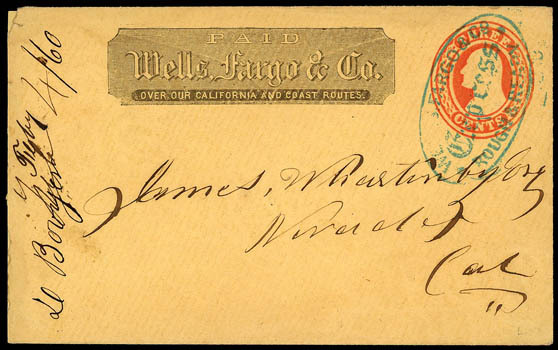 (Rough & Ready) Wells Fargo & Co., Express, Rough & Ready (Nevada), blue oval handstamp on 3¢ red on buff Nesbitt entire to Nevada Cal., printed Wells Fargo frank, docketed "Feby 4/60" at left, Very Fine. 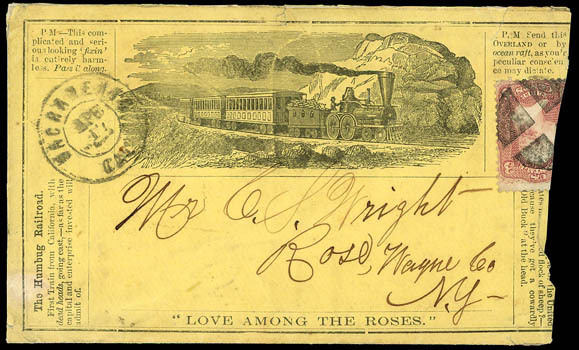 A RARE EXAMPLE OF THE WELLS FARGO & CO. EXPRESS ROUGH & READY OVAL HANDSTAMP.